Don't Staple Your Shirt To The House Like Clark Griswold! The length of our cord (choose 24 foot or 48 foot) lets you arrange strands in a variety of patterns or clusters via zip ties. For installation, we recommend a 16-gauge guide-wire and then affixing the lights every 3 or 4 to the guide-wire, or anchor the heavy-duty strand with cup hooks into material that can support the weight. To stage a canopy, we strongly suggest you suspend strands from tensioned and anchored wires while spreading the load across truss wires. Not recommended for a trellis or for combining with paper lanterns. Power the lights via 110v plug-in outlets, not designed for 220v outlet use. TRANSFORM YOUR BACKYARD INTO A COZY OASIS AND RETREAT: The Ambience Pro Outdoor String Lights will create a beautiful backyard atmosphere where you can sit back, relax, and enjoy the evening. These vintage Edison string lights with exposed filaments give off a warm, nostalgic glow so that you can come home after a busy day and enjoy your very own retreat. Ambiance Pro lights are bright enough to dine under without a glare so that you can enjoy your dinner outdoors on a nice evening. PERFECT HANGING OUTDOOR LIGHTING FOR ENTERTAINING: Create a rustic, warm, and inviting atmosphere with these exquisite, lantern like outdoor light strands. They add the perfect touch to a wedding, cocktail party, birthday party, BBQ, bistro, cafe, and so much more. Each strand contains 15 hanging 11 Watt bulbs spaced 3 feet apart. You can connect up to 8 strands end to end to custom arrange your lights. You can be creative to create a beautiful décor that your guests will appreciate and admire. STRONGEST OUTDOOR STRING LIGHTS ON THE MARKET: Brightech lights are designed to withstand the wear and tear of year-round outdoor use. They are weatherproof and built with Brightech's durable WeatherTite Technology so that they can withstand extreme temperatures, rainy, windy, or damp climates. 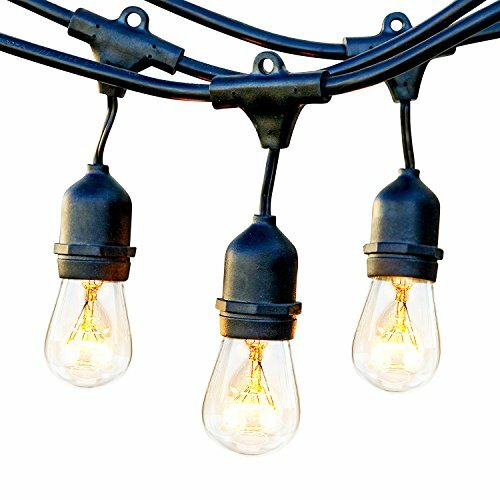 The light cord is rubbery, flexible, and thicker than a traditional cord so that you can confidently leave these ultra durable commercial string lights on display during all seasons. DIMMER COMPATIBLE TO SET THE RIGHT MOOD: For greater mood lighting flexibility and a soft glow, wire the lights to a dimmer switch to create softer lighting to enhance the atmosphere of a romantic dinner for two, an elegant nighttime celebration, or a wedding reception. The dimmer will also work perfectly on your porch, pergola, patio, and gazebo to maintain a softer, more elegant appearance year-round.